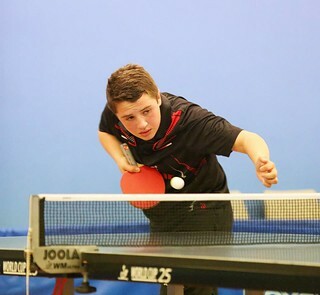 Some of the Island's youngest players turned out to compete in the opening event on Saturday morning and the talented Ben Sharp and Caden Brouard lived up to their billing as the seeded players for the event. Sharp had the toughest semi final against Zaheer Anees. Anees, at only 7, was one of the youngest entrants in the draw, but he showed his potential during the encounter and admirably went down in 5 games. Brouard was much more comfortable during his semi final clash against Freddie Walker, losing just 14 points during his straight game win. Top seed Luke Bichard will play against 3rd seed Corey Brouard in the final, both fresh from their recent Island representation at the British Primary Schools Championship. Bichard is already a Division 2 competitor in the local leagues and he showed his absolute superior class during the event, not dropping a single end throughout. His run culminated with a win over Alderney's best girl and 7th seed Marli Barker. Brouard was expected to reach the last 4 due to his number 3 seeding, however he needed to play well to overcome Ridunian 6th seed Tom Cosherill in the Quarter finals, winning in 5 games. The 4th Division player then came up against a real test in the form of 2nd seed and established 3rd Division player Dan Collenette. Collenette has reserved in Division 2 on numerous occasions this season and picked up some mightily impressive scalps along the way, making him strong favourite in the encounter. Brouard had competed very well in the recent Primary Schools Championship and he carried his confidence from that tournament with him into this crucial encounter. Collenette trailed 2-1 before steadying the ship and comfortably winning games 4 and 5 to put himself within touching distance of the final. Brouard showed great resolve and managed to overturn the deficit and clinch the excellent win in 7 games, 11-8 the score in the final end. Top seeded Daisy Kershaw will compete against the number 2 seed Marli Barker in the final. Kershaw cruised past Ridunian Melissa Johns in straight games at the semi final stage and Barker beat fellow Alderney player Amy Wesley in 5 games in the other. Ben Foss will meet Ryan Bichard in the final, to take place on Saturday evening. Foss reached the final without loss and finished with a straight game win over Luke Bichard. Ryan dropped an end to Tom Cosherill in the Quarters and was up against it whilst trailing 4th seed Matthew Casey by 2 legs in their semi final encounter. Bichard has great control of his emotions for his age, and he showed a mature display in reeling off 4 consecutive games to close out the match in 6 games.